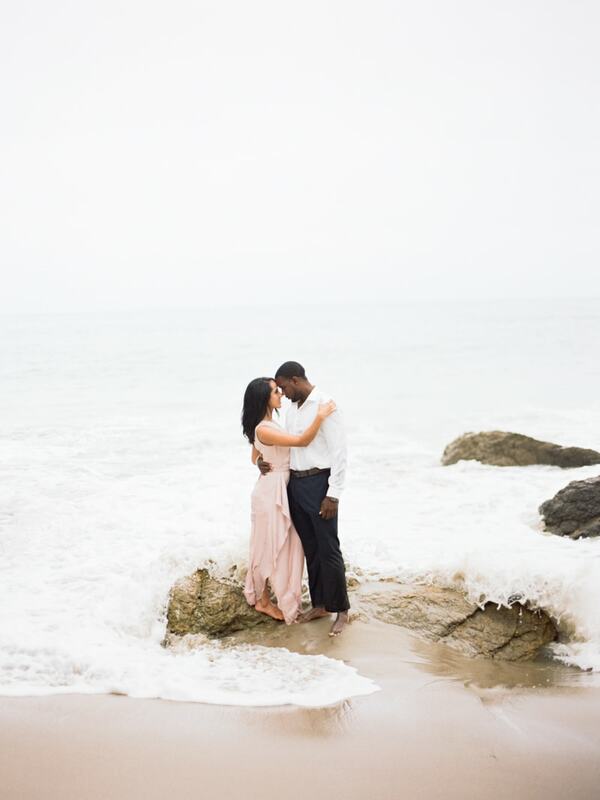 Cristina and Evan’s Malibu engagement session happened because of a compromise. While Cristina always dreamt of being married on the beach, Evan – more of a traditionalist – had his heart set on a ceremony in a church. They decided on the Wayfarer’s Chapel that overlooks the stunning California coast. But, to please the beach-loving bride, the photographer managed to shoot their engagement session at Peter Strauss Ranch, ending the day at El Matador Beach. 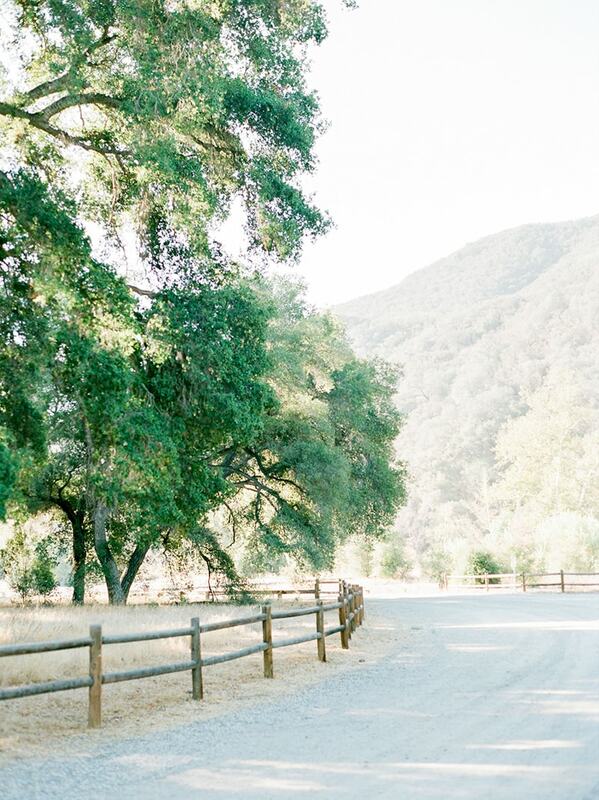 Peter Strauss Ranch is an incredibly scenic location near Malibu with its rolling hills, verdant landscapes and of course, California Oak woodlands. Cristina and Evan spent the first half of the shoot exploring the park. 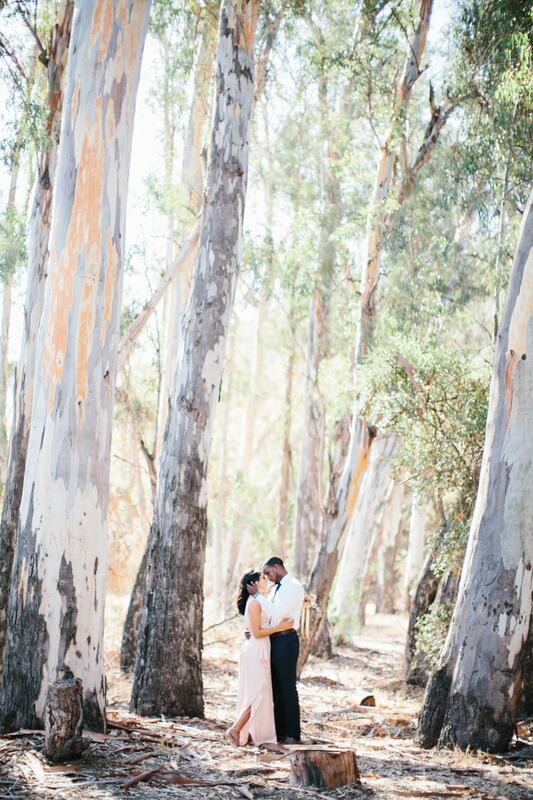 Cristina looked gorgeous in an ivory V-neck gown that was light, airy and perfect for the California sunshine. Cristina showed off her gorgeous rectangular engagement ring through the delicate touch of a tree. Evan was as handsome as ever in a white button down shirt, black tie and dark blue pants. Together, they truly make a stunning couple. The impressive oaks towered over them as they shade a kiss in the shade. Cristina even carried a small collection of flowers. The second half of the shoot found them at the photographer’s favorite Malibu spot – El Matador Beach. They each took a turn standing over the shore, looking out from atop a large boulder. They huddle together near a small cove and hold hands as they walk along the short. While the sky turned gray, the couple didn’t seem to notice. They got noticeably closer and closer to the water. They slowly found themselves dipping their toes in the ocean. Evan took Cristina for one last dip, where the water rushed and broke against the rock and sprayed water all around them. But they didn’t care – there was nowhere else they’d rather be. Cristina and Evan’s engagement session teaches us an important lesson. We all come to marriage with different ideas but it’s how you compromise and make the perfect choice that.